If you’re a lucky healthcare traveler who’s landed a job in San Francisco, you’ll have a wealth of things to do just steps from your front door. 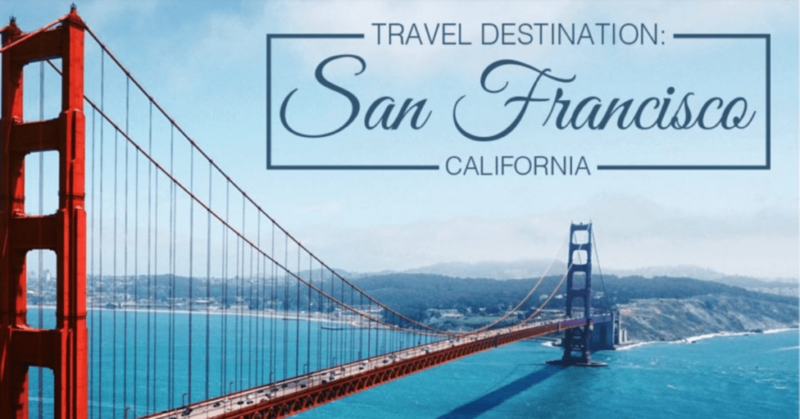 While it would take practically a lifetime to see it all, you’ll be able to take in quite a bit during a three- or six-month travel job, including these options that are some of the best to enjoy during your time Golden Gate City. Most people who visit San Francisco simply drive across the Golden Gate Bridge, but they never truly experience it. To do so, walk the 1.7-mile sidewalk that leads from the city to the Marine Headlands. Along the way, you’ll be able to take in the magnificent skyline, the glistening expanse of the Pacific, Alcatraz Island and the soaring towers. One of the seven wonders of the modern world, and one of the most photographed, it’s something you’ll never forget. To capture a photo of the iconic bridge, head to one of the locals’ best kept secrets: Baker Beach. Here you’ll get a panoramic view of the Golden Gate as well as the Marine Headlands. Climbing this staircase located at 16th and Moraga, is a great way to burn off some steam after a day hard at work on a travel assignment, and soak up a jaw-dropping panorama of the city. It was designed by local artists, created by over 300 area residents and includes 163 precipitous steps with beautiful mosaic tiles that paint a path that shimmers from the sea to the sky. When you gaze up at it from below, it looks as if it’s a stairway to heaven. Once on top, you’ll be in Grand View Park, where much of the city, including the Golden Gate Bridge, comes into view. Catching a ride on a cable car is a must for anyone who visits San Francisco, including those who are on a travel job. Just do it the right way – instead of riding the popular Powell/Mason or Powell/Hyde lines which draw hordes of tourists, take the California line. You’ll be able to ride this relic from the days before automobiles, and an officially designated historic landmark, up and down the steep hills without the wait. The Presidio is a former military post turned national park, and it’s an ideal place for enjoying nature and a variety of outdoor activities with its spectacular vistas and scenic trails. Bring a picnic and just marvel at the view, or take a hike. When you have a Sunday off, between April and October, be sure to head here for the gathering of food trucks known as “Picnic at the Presidio.” You’ll be able to indulge in a wide range of local and international fare while listening to live music or playing lawn games. Any healthcare traveler, or really anyone working in the healthcare industry, is often in dire need of relaxation and soothing sore muscles at the end of the day. If that’s you, visit the Kabuki Springs and Spa, a Japanese-style bath house. An oasis of serenity in Japantown, it offers a variety of massage, facials and wraps as well as featuring a steam room, sauna, warm pool and a cold plunge. While just about every tourist goes to Pier 39 for seafood, those in the know avoid that spot as it comes with a high price tag and only so-so quality at best. The Swan Oyster Depot, named one of the top spots for seafood in the nation, is the place locals head to. The tiny eatery opened up more than a century ago, and while it has just 12 bar stools, you’ll find some of the tastiest dishes, from shrimp cocktail and clam chowder to fresh oysters and crab salad around. As it also tends to draw long lines, you probably won’t be able to fit it in during a work break. Arrive early to avoid the wait and indulge in a late seafood breakfast.